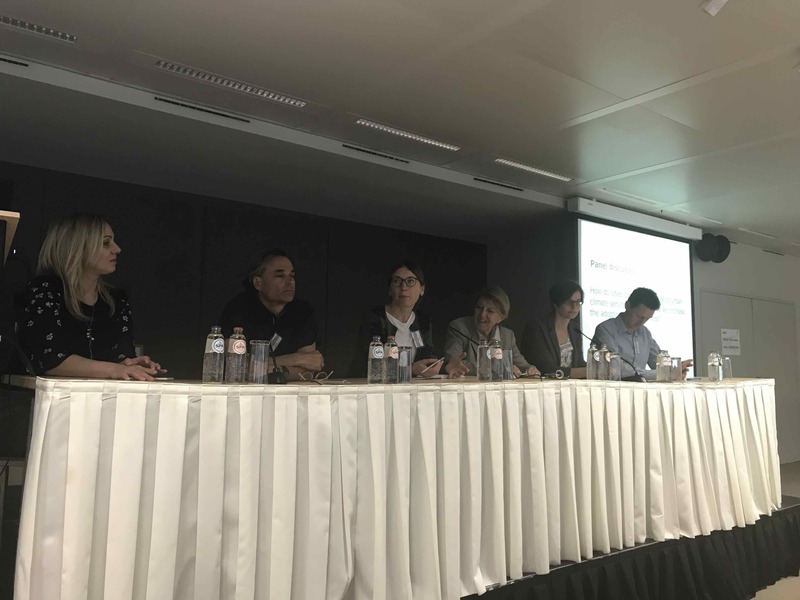 The 22nd of April saw the Climate-fit.city project host its Green Week 2018 Partner Event in the surroundings of the VLEVA Auditorium in Brussels. The event discussed the initiatives which participating cities within the project are taking to incorporate climate intelligent eco-design coupled with the tangible benefits of urban climate services. The panellist of speakers featured Climate-fit.city consortium partners (14 partners from 6 different countries) consisting of city officials from Antwerp and Prague, technical experts from KU Leuven, Joanneum Research and GISAT along with a policy officer from European Commission’s DG CLIMA. 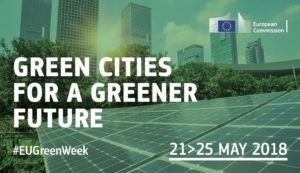 The overarching theme for this year’s edition of EU Green Week is “Green Cities for a Greener Future”. The Climate-fit.city project focuses upon translating the best available scientific urban data into information which is relevant for both public and private end-users operating in cities across a myriad of sectors. This event showcased three specific three sectors – ‘active mobility’, ‘emergency management’ & ‘urban planning’. Once fully established, the service will quantify the impacts of climate (change) and act as ‘one-stop shop’ for the delivery of urban climate services to city users and customers. The creation of a market for such solutions will be coupled with a flexible and ever evolving network of business partners operating throughout Europe (and beyond), responding to the need for cost-efficient and reliable urban climate information. An interactive element was introduced to the event via the use of Slido which allowed for the audience to be directly involved. Firstly, they introduced the #ClimateFit into their mobile devices and were subsequently posed questions relating to urban climate services. Getting real-time feedback from the delegates allowed for valuable insights from the audience to help shape the engaging discussions and the questions which were asked. Cédric Hananel from Arctik kicked off proceedings with a welcome to the participants and a brief introduction of the event. Following this, Dina Silina, Policy Officer, Directorate-General for DG CLIMA provided a synopsis of the policy landscape vis-à-vis climate adaptation for European cities, identifying current knowledge gaps and the need for an integrated approach. She spoke of the pivotal role which transboundary co-operation plays in readying our cities for mitigation and adaptation efforts concerning the adverse impacts of climate change. Concrete examples of initiatives which incorporate this ethos are the Covenant of Mayors for Climate & Energy and the EU’s Urban Agenda. Cities and stakeholders are pooling their resources together to develop new policies and strategies which will accelerate the transformation of our cities. Filip Lefebre, the business developer from VITO detailed how Climate-fit.city assists in the decision-making of local government officials via the use of climate services. He cited the key barriers facing many European cities – “the puzzle of the project” – such as the increasing frequency of heat waves, the urban heat island effect & flash floods. Furthermore, he highlighted the fact that socio-economic factors cannot be overlooked when formulating holistic policies. Next, Maria Kazmukova, city official from Prague, and Katerina Jupova of GISAT, spoke of the experiences of Prague as a ‘user city’ within the project and how effective and environmentally friendly urban planning and decision-making play a key role in issues such as the mitigation of urban heat islands. GISAT is an urban planning service which provides high quality and affordable geoinformation which city officials can utilise to make informed decisions on how best to mitigate negative impacts and implement appropriate adaptive solutions. 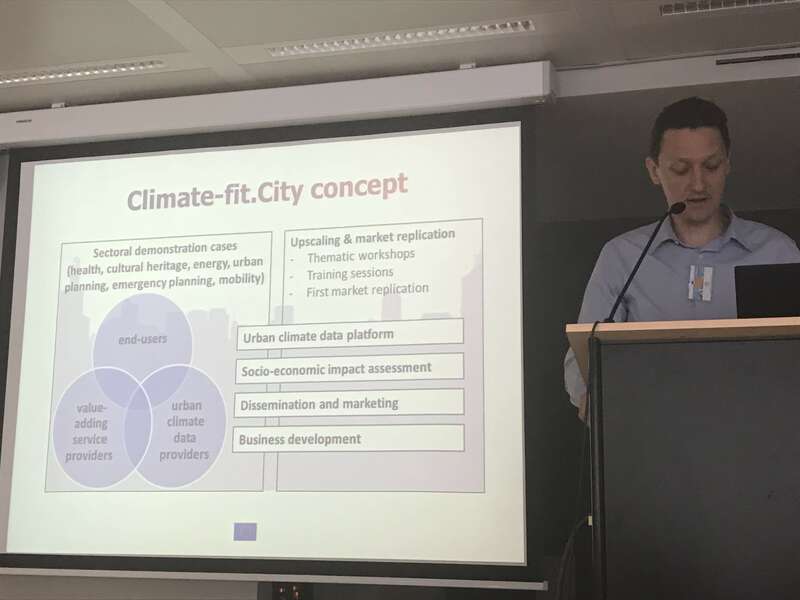 Climate-fit.city is developing an Emergency Planning Service and using the city of Antwerp as a case study. Professors Willems, KU Leuven and Erik De Bruyn, spoke on their work concerning urban pluvial flood risk analysis and how the city is formulating climate-resilient emergency planning for the city. The final speaker was Judith Köberl of Joanneum Research based in Vienna. The city is being used as a test-bed for active mobility and is collaborating with the Bike Citizens organisation (private entity) to support cyclists and pedestrians in finding the optimal climatic cycling routes in terms of comfort for users (e.g. routes least affected by wind, heat, etc.) Moreover, this scheme supports the city in terms of infrastructure planning to build a climate-resilient, integrated urban cycling and walking infrastructure system. The concluding phase of the event involved a panel discussion with the speakers. The guiding theme centred on current city efforts to integrate urban climate services into their policy formulation and planning along with how best to accelerate the adoption of these services. The fruitful discussions ranged from the primary challenges facing cities such as budget constraints, lack of awareness (both in terms of funding opportunities and existing adaptation solutions) to concerns over the current urban planning regulations throughout the EU. Currently, only 26 EU cities have a bespoke adaptation in place; this highlights the disconnect between large scale policies being implemented and the actual reality on the ground in many cities. The need to engage with local stakeholders and to use their knowledge and insights is viewed as being crucial. Each city will have their own specific challenges and may require a tailor-made solution. Oftentimes there is no ‘one size fits all’ solution. Co-designing services with stakeholders and involving industry and the private sector will allow for informed and comprehensive solutions. Furthermore, such an approach is imperative if the uptake and diffusion of urban climate services throughout the EU and beyond is to become a reality. Please note that the presentations from the conference can be found via this link.